March 20, 2019 March 20, 2019 J.C.
Minors being held at the clandestine facilities initially were placed at known shelters around the country but later were transferred to these off-the-books facilities that specialize in providing for youth with mental health and behavioral challenges. Under the Flores Settlement Agreement, a 1997 pact that sets the standards for how unaccompanied minors are treated while detained and calls for their swift release, the federal government is supposed to provide attorneys representing detained children with a regular and detailed census of each minor in the Office of Refugee Resettlement’s custody. The practice appears to violate the long-held agreement. Holly Cooper, who represents the class of unaccompanied minors in the agency’s care, says the government failed in its obligation to report every minor’s location – and believes the refugee agency still is withholding information about other locations, even after being pressed to do so. “Detained unaccompanied children with mental health issues are some of the most vulnerable children, and when the government does not provide access to their whereabouts, it calls into question the basic underpinnings of our democratic institutions,” Cooper said. Cooper learned about one of the facilities months ago. After requesting information about additional sites, she learned about several others. Now, she told Reveal from The Center for Investigative Reporting, she’s still getting credible information that the list the government provided to her is incomplete. The Office of Refugee Resettlement acknowledged a request for comment but hadn’t yet responded to specific questions by the time this story was published. Robert Carey, who directed the agency during the final two years of the Obama administration, said that as far as he knew, no such arrangements were in place before Donald Trump became president. “If that was happening, it was something that I was not aware of,” he said. Some facilities, he said, occasionally would subcontract specialized medical or educational services. But Carey said he wasn’t aware of children being housed outside of publicly disclosed shelters. 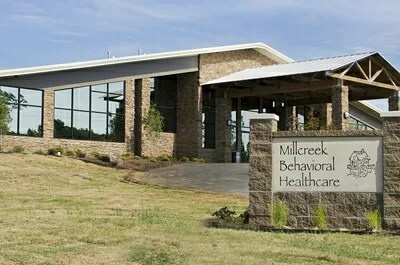 One of the care providers, Millcreek Behavioral Health in Fordyce, Arkansas, operates as a residential treatment center and is holding at least eight children in the refugee agency’s custody, according to information obtained by Reveal. Inspection reports obtained by Reveal do not suggest any serious state violations; 911 service call records to the facility were requested by Reveal in December, but the local office of emergency management hasn’t decided whether to release the documents. Another provider, Rolling Hills Hospital in Ada, Oklahoma, is a facility for children and adults that is holding at least one minor in the refugee agency’s custody. An investigation by The Oklahoman published earlier this year revealed that patients complained of broken bones, along with “allegations of sexual harassment and physical abuse” at the hospital. A 2017 inspection report reviewed by Reveal describes multiple violations, including employees who said the hospital failed to provide staff orientation, patient records that indicated registered nurses had not provided necessary assessments, and a facility where patient deaths went unreported to the governing body for oversight. Officials with the care facilities either declined to comment or did not respond to emails and phone messages from Reveal. “I don’t have anybody that needs to comment,” said Pam Burford, an administrator at Millcreek Behavioral Health. Néstor Dubón, a sponsor for an asylum-seeking cousin who’s being held at Millcreek, hasn’t visited the site but describes it as a better alternative to the Northern Virginia Juvenile Detention Center, a shelter whose federal contract came to an end in 2018, where Dubón’s cousin previously was held. Dubón was told that his cousin would be transferred to Arkansas but was unaware that the facility’s use as a shelter wasn’t public. No matter where his cousin is being held, Dubón’s chief concern is his cousin’s release. He said he’s met all the requirements asked of him by the Office of Refugee Resettlement to gain his cousin’s freedom. Dubón’s 16-year-old cousin has been in the agency’s custody since he first entered the United States more than two years ago. Both Millcreek and Rolling Hills are owned and operated by Acadia Healthcare. Reveal has determined that 50 of Acadia’s facilities – operating in 23 states and Puerto Rico – provide residential care for minors, but it’s unclear how many of those facilities serve youth in the refugee agency’s custody. Acadia has been publicly traded on the NASDAQ for nearly a decade. With hundreds of facilities and a capacity of over 18,000 beds, it is one of the largest treatment networks in the country. Its services include care for behavioral health and addiction. In November, a critical investor detailed a litany of abuse allegations at Acadia-run facilities, including Rolling Hills. A December 2017 lawsuit accused Acadia and Rolling Hills of permitting ongoing sexual abuse inside a facility for children, destroying video evidence and refusing access to a state investigator. Former Acadia CEO Joey Jacobs has acknowledged that regulatory problems led some states to temporarily stop referring people to Acadia facilities. But Jacobs announced those problems had been resolved, at least in a call with investors in November 2018. Jacobs left the company in December. Acadia has accumulated $3.2 billion in debt from buying up local care centers, prompting critical attention from investors who doubt that it can be paid off. Acadia Healthcare did not return a call for comment for this story. The Office of Refugee Resettlement also hasn’t disclosed that it houses children at Devereux, a nonprofit behavioral health organization based in Pennsylvania that operates in multiple states, Reveal has confirmed. One of its facilities in Florida is holding at least five minors for the federal agency. The previously undisclosed care network also includes residential treatment centers operated by KidsPeace and Youth For Tomorrow. These two organizations already contract with the government as shelter providers, offering general care. But they don’t have public agreements to provide the more intensive behavioral and mental health care of a residential treatment center. KidsPeace communications director Bob Martin told Reveal that there were “a very small number of cases” in which his organization has accepted children from other refugee agency shelters for placement in its residential treatment center. In those cases, he said, no new contracts were signed, beyond what he called a “letter of agreement” with the agency. “It’s been an extremely rare occurrence,” Martin said. Martin said any questions about government oversight in those cases should be answered by the Office of Refugee Resettlement. Courtney Gaskins, director of program services for Youth For Tomorrow, confirmed that the refugee agency has requested that her organization take children in its residential treatment wing. “We’ve gotten requests for those,” she said. But Gaskins declined to say whether her organization has ever agreed to do so. “I wouldn’t comment if we did,” she said. Reveal reviewed federal contract and grant awards to Youth For Tomorrow and KidsPeace but found no mention of residential treatment center services. Some of the nonprofit organizations involved in this network are well-monied and hold powerful connections in the media and government. Devereux’s board includes James H. Schwab, who, according to his LinkedIn profile, was the president of Vice Media until December and remains a board member and senior adviser at Vice. Oliver North and Fox News analyst Brit Hume sit on the Youth For Tomorrow board of directors. Merkley has introduced a bill that would require shelter operators to grant access to members of Congress. “ORR needs to provide answers immediately about where they are holding asylum-seeking children, and what, if any, child welfare regulations those facilities are meeting,” he said. The lack of disclosure of facilities where unaccompanied minors are held leaves a vacuum of public oversight. It’s unclear how the refugee agency regulates and inspects these facilities. For its publicly listed shelters, the agency sets a minimum staff-to-children ratio and training requirements and conducts announced and unannounced inspections. One possibility is that shelter providers are subcontracting the care of certain children to another care provider. According to cooperative agreements between the refugee agency and residential care providers, which Reveal acquired after filing a lawsuit under the Freedom of Information Act, shelters may subcontract services to other entities. In those cases, the federal agency holds the shelter responsiblefor ensuring that “sub-recipients” maintain the same standards of care required by law. Reveal filed FOIA requests in the fall for information about any subcontracts or out-of-network care contracts to care for unaccompanied children. The government has yet to respond. Aura Bogado can be reached at abogado@revealnews.org, and Patrick Michels can be reached at pmichels@revealnews.org. Follow them on Twitter: @aurabogado and @PatrickMichels.